Take a three-day tour to explore must-see sites from the Renaissance and the Middle Ages. 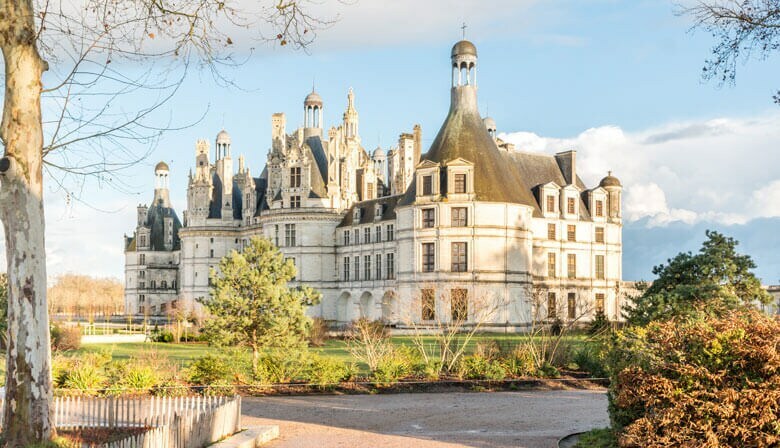 Visit Mont Saint-Michel and six Chateaux of the Loire Valley: Langeais, Clos Lucé, Chenonceau, Cheverny, Chambord and the gardens of Villandry. Our air-conditioned bus leaves at 7:15 am from our PARISCityVISION agency, located in the heart of Paris. A guide-interpreter will accompany you on the trip. After passing through the western districts of Paris, the bus enters the Normandy highway. Drink in the magnificent scenery as you drive through the verdant French countryside. The bus will reach Mont Saint-Michel around 11:30 am, stopping at the entrance to the causeway. Your guide will lead the way to the Relais Saint Michel (or a similar restaurant) located in the bay with a panoramic view of Mont Saint-Michel. Enjoy a delicious meal of regional specialties. 1 bottle of cider + 1 bottle of water for 6 pers. Around 4:30 pm the bus will leave for Angers (about 2.5 hours away). Once you have checked in at the Mercure Lac de Maine (or a similar hotel), where you will spend the night. You will find many restaurants near your hotel to have dinner. After breakfast at the hotel in Angers, you will set off for the Loire Valley. The bus will make a brief stop at the Chateau d’Angers so that you can view the exterior of this medieval fortress before heading to the next destination. The first guided tour of the day will take place at the Chateau de Langeais, located about one hundred kilometers from Angers. Langeais is made up of two very different chateaux: the keep built around the year 1000, considered the oldest in France, and the Chateau of Louis XI constructed in 1465. While you tour the inside of the Langeais chateau you can experience French history first-hand through depictions made with highly realistic wax figures. Next stop: Amboise, about 45 minutes from Langeais. There you will have time for some lunch. Your guide will point out the various restaurants near the Chateau d’Amboise. After lunch, your guide will lead you to Chateau du Clos Lucé, which is just a ten minute walk from Chateau d’Amboise. Built in 1500 and now a UNESCO World Heritage Site, Clos Lucé was once home to Leonardo da Vinci. During the guided tour of the castle you will learn about the private life of this leading light of the Renaissance who spent the last three years of his life there as the guest of King Francis I. About 60 kilometers away lies Chateau de Villandry, the next stop on your journey. Your guide will lead you through the splendid Villandry gardens, which boast paths lined with linden trees, several different levels and a wealth of colors that will surround you with a feeling of peace and tranquility. The bus will then make its way to the town of Tours, about 30 minutes away. You will then settle in and have dinner at the Mercure Tours Nord (or a similar hotel). Your third day begins in Tours with breakfast, then it's off to the Loire Valley. You will board the bus once again to travel to Chateau de Chenonceau. Located approximately 30 kilometers from Tours, Chateau de Chenonceau is a symbolic site for the history of France and a true Renaissance masterpiece. Explore this incredible Loire Chateau with its fairytale architecture that seems to have appeared by magic on top of the Cher river. Built and renovated by famous French women throughout history (including Diane de Poitiers and Catherine de' Medici), the castle bears witness to the refined French way of life with its lavishly appointed rooms. This is why it is known as the "Chateau des Dames". The guided tour of Chenonceau is followed by a tour of Chateau de Cheverny, which is about 45 minutes away. Let your guide lead you through this 17th-century aristocratic estate that embodies the French way of life with its magnificently decorated royal chambers, including a birthing room and a private dining room. Then, explore the chateau's incredible park before enjoying lunch at Saint Hubert Cour Cheverny. The trip will end with a tour of the most majestic Loire Chateau, located about 20 kilometers from Cheverny. On the guided tour of Chateau de Chambord you will learn about the building's fascinating and complex history through its exceptional architecture. Admire the imposing double-helix staircase in the center of the monument, and visit the former royal chambers and other rooms located on different floors. The large terrace with its majestic chimneys offers a remarkable panoramic view of Chambord park. The bus is scheduled to leave Chambord at 6:30 pm and should return to our agency in Paris around 9 pm. In the case of a booking requiring a single room, a supplement of 85€ will have to be paid at PARISCityVISION agency prior your tour departure. - For a booking of 2 people: you will be in a double room without any extra charge. If you want to be in two separate rooms, you will need to book the tour separately and pay the single room extra for each person upon the departure. - For a booking of 3 people: you will be in a double room and a single room. In that case, you will have to pay the 85€ extra upon the departure. Triple rooms are unavailable. Well timed, well guided, informative and perfect amounts of time given for excursions. Guides are great , food is excellent , accondations are comfortable and relaxing. Well done, all well organized. We Loved it.